Classroom libraries are cornerstones of Reading Workshop in the elementary grades. Setting up a new classroom library, though, is a challenge. At Brooks School Elementary, Mrs. Schermerhorn’s third grade students met this responsibility head-on. Here’s how we tackled such a big project in one day! BSE third graders record their observations! The 3rd graders arrived at the school library today with clipboards and pencils in hand. Mrs. Patrick, BSE’s school librarian, presented this key question: What can we observe from the way our school library is organized to help set up your new classroom library? As the young investigators traversed the library jotting notes, new questions and considerations surfaced. 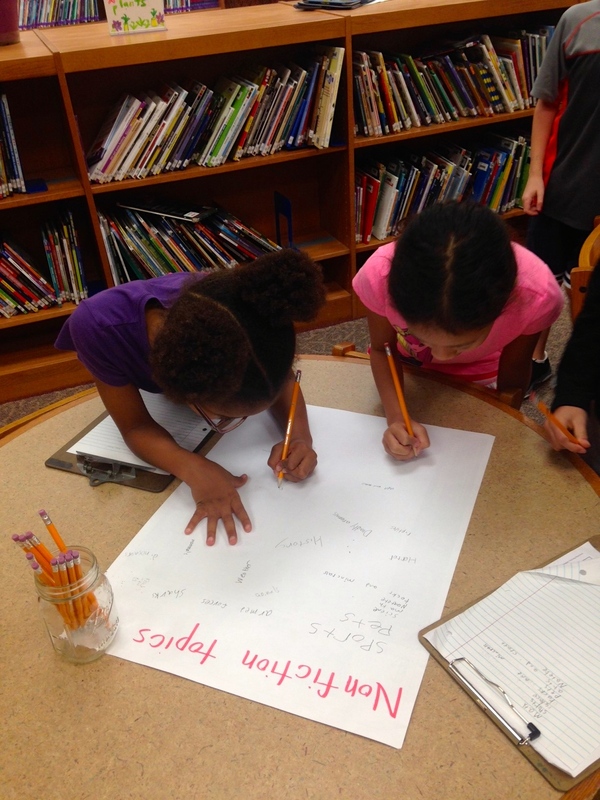 “But our classroom doesn’t have this much space…”, “What kinds of books are most popular in 3rd grade?” Great thoughts! Next the students organized their notes into categories on chart paper. Back in the classroom, we divided the students into groups corresponding with the charted notes. Then the real fun, the book sorting, began! Each group filled book baskets that represented series, favorite authors, genres/themes, or nonfiction topics. What a great start to our new class library! We say ‘start’ because classroom libraries are organisms that change and grow! With the students’ help, we will rotate the baskets to keep the classroom library fresh and relevant. Students will suggest new baskets as new curriculum topics arise. The best part of the day was that students left school with a huge sense of accomplishment and classroom pride!